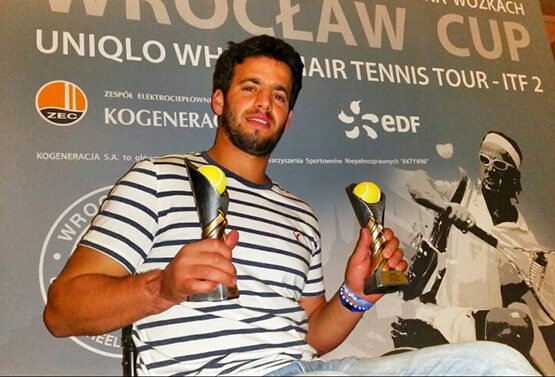 A very moving evening for Itai Erenlib, Paralympic wheelchair tennis player and Zahal Disabled Veteran, after winning the Open Polish Wheelchair Tennis Championship both in the singles and couples category. At the singles game in the Quad category (most severely disabled category), Erenlib beat Italian Antonio Rafaele 6:4, 6:3 and at the couples finals, together with Patrick Ben Oliel of Israel, they beat Italian Rafaele and his British partner Fein 6:1, 6:3. Prior to the Poland tournament, Itai was rated 15 in the world in the Quad category. If by May 2016 he climbs up to the 12th place, he can win the ticket to participate in the 2016 Rio de Janeiro Paralympic Games. 29 year old Erenlib was critically wounded in 2007, while serving as an officer in the ‘Orev’ Special Forces Unit of the Paratroopers Brigade during an operational mission in the Nablus Kasbah.